The City of Saginaw Water Treatment Plant has been in operation since 1929 and is one of the largest drinking water plants in the State of Michigan. Currently, the Water Works has a maximum treatment capacity of 115 million gallons per day. The raw water source originates at Lake Huron’s Whitestone Point, and takes a 65-mile journey to the City of Saginaw. After complete treatment, water is pumped from the finished water reservoirs in Saginaw to 21 communities in the tri-county service area. With this amount of production over such a large area, the Water Works relies heavily on their pumps. One of the main pumps in the almost 90-year-old building needed to be replaced. 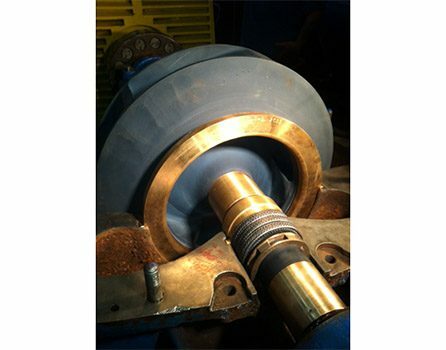 Because the components are no longer available, the city of Saginaw contacted Bernier Cast Metals in search of a new impeller. After technical review, the impeller was reverse engineered and a pattern and core boxes were created. Upon production, the new bronze casting weighed 270 pounds with an outside diameter of 22”. The casting was machined, ceramic coated, assembled and installed in hopes of another 90 years of service.